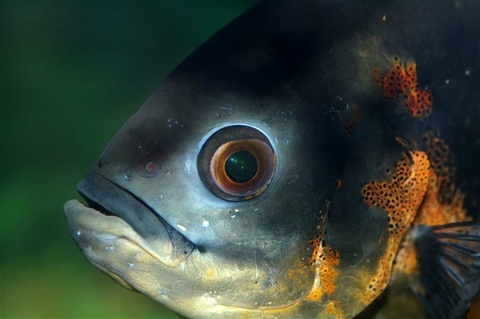 The eyes of most fish species are not so much different from the human eye. Their retina contains rods and cones, thus the ability to perceive visual details, colours as well as changes in brightness. Physiological data has revealed wavelength-tuned photoreceptors in the retina of reef fish suggesting that they can discriminate colour. This was also supported by behavioral studies using classical conditioning, showing that damselfish were able to discriminate coloured patterns for a food reward. Focusing however differs anatomically. Fish and amphibians adjust focus by moving the lens closer or further from the retina. Different fish species have developed special visual abilities to survive in their specific habitats. Fish that live at greater depths have adapted to darkness by developing a greater sensitivity to light and changes in brightness. Coral fishes have developed special colour, stripe and movement patterns as camouflage, a way of defense or to attract a partner.